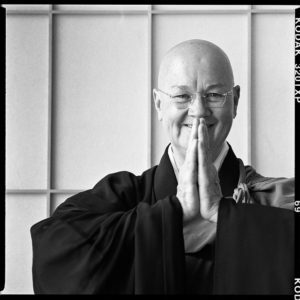 This evening’s dharma talk will be led by Roshi Enkyo O’Hara, Abbot of the Village Zendo. She received priest ordination from Maezumi Roshi and Dharma Transmission and Inka from Bernie Tetsugen Glassman. Roshi Enkyo’s lineage comes through Maezumi Roshi whose teaching was uncommon, bringing together Soto priest training and study of the Rinzai koan system. Moreover, Roshi Glassman’s focus on social engagement and peacemaking underlies much of her vision of Zen practice. Roshi is a Founding Teacher of the Zen Peacemaker Family, a spiritual and social action association. Roshi’s focus is on the expression of Zen through caring, service, and creative response. Her Five Expressions of Zen form the matrix of study at the Village Zendo: Meditation, Study, Communication, Action, and Caring.